Hi, good luck to opening poster. It took me 6 months of searching the UK to find a 2014 IQ3 but it paid off last month! She has low mileage and Toyota FSH but was heavily chipped on both doors and 3 of the strange boomerang (can’t think of correct name) shaped pieces on the sides of bumpers, so I took her straight to a body shop for a respray. She’s looking lovely now. About 9 months ago there were 4 or 5 14 plates on EBay at £9,995. When I started looking in October there were none! I hope it doesn’t take you as long as it took me! I'm still looking. Finding lots of 12 plate IQ3'S and IQ2'S on 14 reg but not 14 reg 3's. Can you post some pics of yours? Hi, I can tomorrow. it’s getting dark here now and I don’t have any pictures. Mine is grey, I think it’s called Decaro Grey but I may not have the correct spelling. 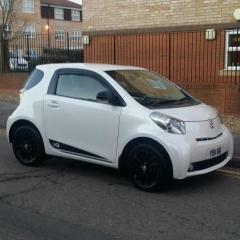 I upgraded from an IQ1 1 litre which I sold today. I did notice that the turning circle was not as tight in the IQ3, not sure if that’s because it has 16 inch alloys opposed to 15? i still have upgrades to do, biggest being the interior lights. That's one rare car you have. Dacuma grey was only available on IQ3. I've got the interior lighting upgrade on my 2014 IQ2 and Parrot bluetooth. Both well worth investing in. Tarquin on here is the man to speak to about lighting upgrade. Hello and thanks for that info. I’m really surprised, it took a lot of legwork to find and it had been described as in perfect condition. She was covered in that brush on paint that looks like nail varnish but fortunately no dents. i dropped her off at the body shop and returned the next day to collect her. The sprayer was extremely stressed out and said he had something awful to tell me. I thought I’d bought a stolen car or that the engine had blown. He explained that his paint machine had broken and he’d called support to get the correct paint mix. It was the wrong colour!!!! A brownish grey! I was so relieved and burst out laughing! I felt so sorry for the sprayer, he looked ten years older! She’s going back in next Wednesday for the correct colour spray. So I’ll put pics on tomorrow but please excuse the odd doors! I love the IQ, they are so much fun! Thanks for mentioning the member who does lighting and the Parrot. I didn’t want the factory satnav as I don’t think it was great so I’m looking to put a parrot in. Where have you installed it please? I have the Parrot MKI 9000. It's the one without a screen and works off of voice recognition. On mine the small microphone is up by the rear view mirror. The control unit that you press to make/end calls I have put on the lower dash on the opposite side to where start button & door mirror controls are. Under where mileage/radio display is. It's well worth getting and is very discreet unlike the ones with digital screens. I had it installed by a company called Creative Sounds in Winchmore Hill in North London although there will no doubt be a stockist list on their website. You won't need sat nav when you have bluetooth as you can play sat nav and music through it via your smartphone.